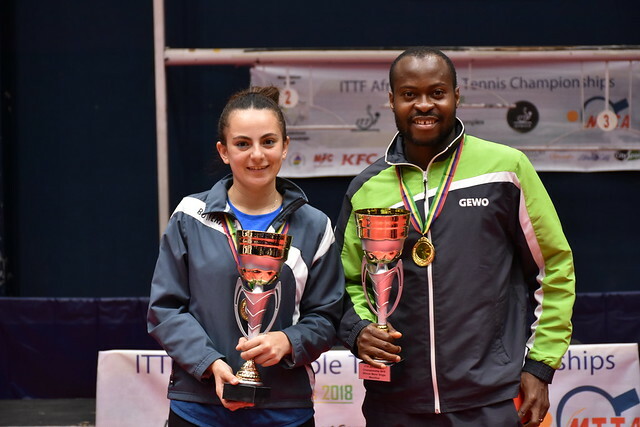 Gold and silver for Egypt but perhaps not in the order anticipated; however as matters approached a conclusion on Saturday 8th September, at the 2018 ITTF-African Championships in Port Louis, Mauritius, their arch rivals, Nigeria were very much centre stage. Youssef Abdel-Aziz and Khalid Assar won the Men’s Doubles title but Ahmed Ali Saleh was the only Egyptian to reserve a Men’s Singles semi-final place; the remaining positions, in the guise of Quadri Aruna, Segun Toriola and Olajide Omotayo, all belonged to Nigeria. At the final hurdle, Youssef Abdel-Aziz and Khalid Assar, the no.3 seeds, accounted for Mohamed El-Beiali and Ahmed Ali Saleh, the no.2 seeds (11-5, 11-9, 11-9, 11-2) to secure the Men’s Doubles title and thus added to Egyptian success in the event. It is the 13th time that a pair from Egypt had secured the title; only once, in what is now 23 editions of the tournament, has the top step of the podium not been owned by a pair from either Egypt or Nigeria; the one exception was in 2008 in Kinshasa when South Africa’s Theo Cogill and Shane Overmeyer emerged victorious. Youssef Abdel-Aziz and Khalid Assar become the 20th pair to win the event; notably only two partnerships have succeeded on more than one occasion. Colleagues Galal Ezz and Hosni Sonbol won in 1974 in Alexandria and two years later in Cotonu. More recently Ahmed Ali Saleh and El-Sayed Lashin succeeded in 2002 in Bizerte, in 2007 in Brazzaville and in 2012 in Cairo, the most recent occasion when Egypt emerged victorious. Defeat for Ahmed Ali Saleh in the Men’s Doubles final but not in the penultimate round of the Men’s Singles event, where he prevented a possible clean sweep of medals by Nigeria. He accounted for Bode Abiodun (9-11, 11-4, 11-9, 11-8, 11-5) in a round where the player to attract the attention was Olajide Omotayo. In the previous round he had caused a major upset by beating Mohamed El-Beiali, the no.3 seed (9-11, 11-9, 11-8, 11-9, 11-9); at the quarter-final stage he continued his liking for Egyptian adversaries. He recovered from a three games to two deficit to end the hopes of Shady Magdy (10-12, 14-12, 6-11, 11-9, 7-11, 11-5, 11-5). The win to some extent avenged the defeat experienced in the first round of the Men’s Singles event at the recent 2018 ITTF Challenge Seamaster Open when losing to Mahmoud Helmy (8-11, 9-11, 11-6, 11-9, 11-3, 11-2), also from Egypt. Impressive from Olajide Omotayo and Quadri Aruna, it was the same from Segun Toriola; he proved too experienced for 21 year old Aly Ghallab (11-6, 11-7, 11-8, 11-5). He now meets Ahmed Ali Saleh in the penultimate round. Play concludes in Port Louis on Sunday 9th September.